Jessie and Seth's romance and marriage was quick. As was Jessie's temper! Not long after they were married they found themselves arguing all of the time. Nothing Seth did could please Jessie. It became even worse once their daughter was born. Seth couldn't handle anymore and decided it would be best if he left. 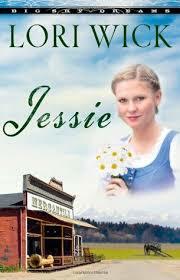 Leaving Jessie to raise 2 daughters, one that was born after Seth left. Now 8 years later Seth has returned. He's a changed man, but can Jessie ever trust him again? Seth Redding is a character we met in the Yellow Rose Trilogy. He's the man that abducted Darvi and then fancied himself in love with her. Now after spending time in prison for his part in the abduction Seth has repented and turned his life over to Christ. I love reading stories of changed lives and what the Lord can do with broken people. Seth is definitely changed but Jessie isn't quite sure if she can trust that. And most of all she has no desire to believe in a God that she is sure does not exist. Seth patiently loves her and his daughters. He consistently shows Jessie that he is there to stay. I loved the changed Seth. He was a likable guy in A Texas Sky even though he was totally misguided in his behavior. Another part of the story that I enjoyed was Hannah and Nate's romance. It was sweet and heartwarming. Not my favorite Lori Wick trilogy, but still sweet reads filled with faith and romance.